Moore On Running: Super Bowl Sunday is the Perfect Rest Day! Super Bowl Sunday is the Perfect Rest Day! I finished the week with two fast days and a long run. Thursday, I went out for a four mile quick run. We really didn't do a Tempo Run on Wednesday, so I wanted to get a fast four miles in with negative splits to help train my body to work harder on these short runs (8:39, 8:26, 8:04, 7:52). Saturday, I met up with the Palmetto200 runners for an eight mile run (which turned out to be nine miles). I was leading a pace group (9:15-9:30), which ended up being two of us (11:09, 9:35, 9:26, 9:12, 8:52, 8:53, 8:54, 8:42, 8:41). We went through a great part of the Old Village. I was running with my friend Michael again. He had not seen much of this area so it was cool to run it with him (even if he didn't do a ninja stuntman flip, roll, jog this time). We hit our pace (maybe a little fast at the end) and ended up running nine miles, which ended up being Michael's longest run! Today, I am resting up for a long week. 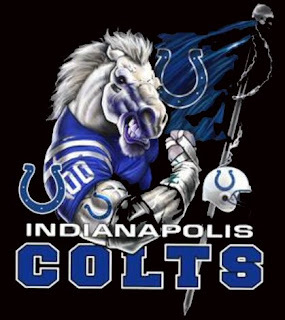 Plus, its Super Bowl Sunday - GO COLTS!! !